Aircraft engines emit soot particles. These act as condensation nuclei for small, supercooled raindrops that freeze immediately to form ice crystals that are visible in the sky as contrails. Reduction of the warming effect of contrail cirrus (in milliwatts per square metre [mW/m2) due to an 80 percent reduction in ice crystal formation in contrails. Shaded areas show statistically significant changes using a 95 percent significance level. Contrail cirrus clouds have a similar climate impact to carbon dioxide emissions from aviation. Fewer ice crystals reduce the optical thickness of contrail cirrus and also shorten their lifetime. Fewer soot particles in the exhaust stream of aircraft reduces the formation of ice crystals and therefore the climate impact of the resulting contrail cirrus. Halving the ice particles that form in the contrail decreases the climate-warming effect of the contrail cirrus by 20 percent. The effect is halved if there are 80 percent fewer ice crystals. This is shown in a study conducted by the German Aerospace Center (Deutsches Zentrum für Luft- und Raumfahrt; DLR), the results of which have been published in the Nature Partner Journal (npj) Climate and Atmospheric Science. 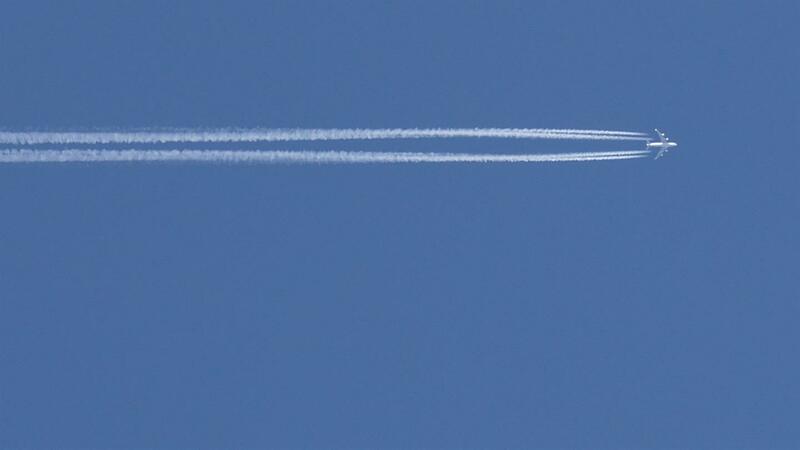 "In our theoretical estimates, we found that a significant reduction in soot emissions is required to reduce the climate impact of contrails effectively," explains Ulrike Burkhardt from the DLR Institute of Atmospheric Physics in Oberpfaffenhofen. "Research into low-soot engines and alternative fuels to counteract the climate impact of aviation is worthwhile, as contrail cirrus today have an impact similar to the total of all the atmospheric carbon dioxide emissions due to air travel over the past 100 years combined." Aircraft engines emit soot particles. These act as condensation nuclei for small, supercooled raindrops that freeze immediately to form ice crystals that are visible in the sky as contrails. The ice crystals in the contrails can last for several hours in cold, damp conditions at heights of around eight to 12 kilometres, and high clouds form that are known as contrail cirrus. Depending on the position of the Sun and the ground, the clouds can trigger a local warming or cooling effect, with research work showing that the warming effect predominates globally. The occurrence of contrail cirrus can vary greatly depending on time and location, so just a few contrail cirrus outbreaks are responsible for much of the warming effect. "Based on our theoretical model calculations, we were able to establish how fewer ice crystals reduce the optical thickness of the contrail cirrus, due to the reduced numbers of soot particles, and also shorten the lifetime of the clouds," says Burkhardt. "Overall, this results in less cloud cover due to contrail cirrus-induced clouds and a lower climate impact. 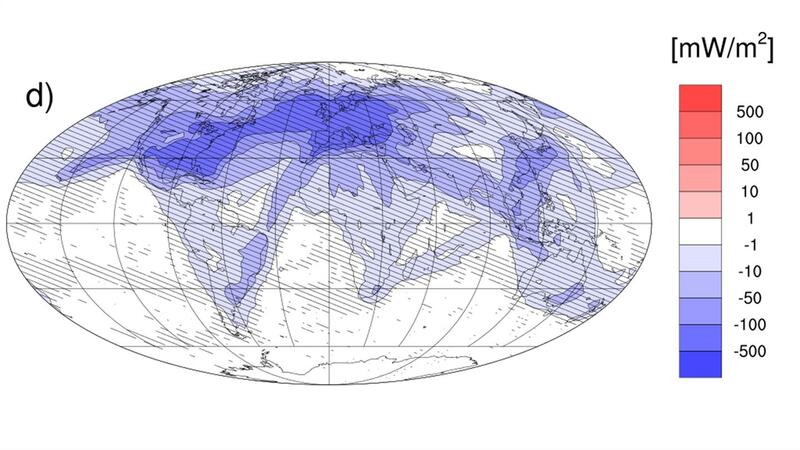 A reduction in soot particle emission is particularly effective during significant contrail cirrus outbreaks." The interplay between the choice of fuel and combustion in the engine is decisive in reducing soot emissions in aviation. For example, new engine technologies enable soot emissions to be reduced as a result of combustion at higher temperatures, even using conventional fuels. Intensive research is being carried out into the reduction of soot emissions through the use of alternative fuels with a lower proportion of cyclic hydrocarbons, which have a significant influence on the formation of soot in the combustion process. DLR and NASA conducted joint research flights in January 2018 to investigate the effect of different fuel blends on soot emissions and the associated formation of ice crystals. Based on data from the research flights, the researchers hope to demonstrate in practice and in detail the theoretically estimated reduction in the formation of ice crystals through less soot. The results are expected in summer 2019.